Can you herniate your cervical disc from a violent sneeze? A herniated disc from a violent sneeze? We had a interesting case come in the other day, one of my regular Chiropractic patients that comes in for a monthly tune up came in complaining of horrible neck pain, that was giving her a headache and causing tingling and burning in her right fourth and fifth finger. She was super stiff and wasn’t even able to lay face down without pain, during the history the only thing that she can mentioned is that she recently has been flying internationally and had a “massive sneeze” and her neck started to hurt and gradually got worse and worse. She wasn’t able to sleep or find a comfortable position and taking over the counter pain relievers did little to alleviate pain. Her Range of motion was severely restricted. Bulging disc at C4-C5 without stenosis, Bulging disc and disc space shortening at C5-C6. Right parasagital herniation with posterior herniation with posterior-inferior extrusion and Central disc herniation at C6-C7 with thecal sac indentation. These MRI findings are typical of a Motor vehicle accident, so this Violent Sneeze acted as a hyper flexion, extension injury or a whiplash type injury that caused bulging and herniated discs. Believe it or not, the human sneeze has actually been clocked. A simple sneeze can travel at over 100 MPH - that's right, even faster than many cars will travel. Think of trying to instantly stop a vehicle traveling at that high a rate of speed. While the mucus of a sneeze weighs thousands of pounds less than that car or truck, you still have a rocket propulsion system in your head. Understand, too, that the car may fare far better than your poor head. Our skulls and their accessory organs and glands are packed in extremely tight quarters. The very kind of percussion involved in a suppressed sneeze can wreak serious injury, mostly to the structures within our heads and neck. We started her on Cox cervical flexion distraction, Acupuncture and Cervical spinal decompression to unload the discs. She is also talking some anti-inflammatory medication that was prescribed by the facilities medical doctor. She is on the road to recovery and will return to enjoying her life pain free thanks to Chiropractic care and Spinal decompression. Never hold back a sneeze because this can lead to a different set of problems but cover your mouth and use your hands to support your head and prevent the excessive movement when you sneeze if you are a violent sneezer. 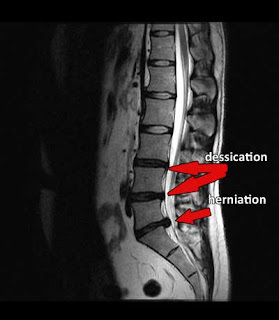 Are you suffering with a bulging or herniated disc in San Fransico? He is the Best in the Bay area! It really is amazing the amount of pressure and force that can result from sneezing. I have had maybe a dozen cases like this in my 20 years in practice. This is where nonsurgical spinal decompression really comes in handy.